Billionaire owner of sport’s team Tottenham Hotspur was seen in his 321ft-long yacht manoeuvring in the very narrow River Thames within the English capital city, London. The yacht, which is said to be the 40th longest in the world can reach speeds of up to 23mph, attracted a great deal of attention as it stood out in the city of London. Yachts of this size are rarely seen on the Thames, due to it’s narrow lanes and often awkward bends. The yacht itself was built in Germany and is said to be able to cater for 16 guests, and has a full-sized tennis court on board. The owner, 80-year old Joe Lewis owns Premier league football team Tottenham Hotspurs of North London. He has two children and is said to be worth over $5 billion, he also now lives in the Bahamas, which is why his 321ft-long yacht is rarely seen on the British rivers. 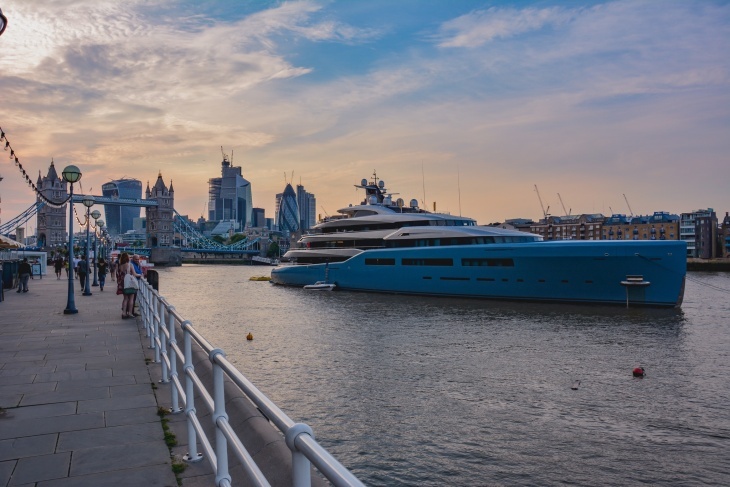 London being one of the perfect playgrounds for the rich and famous, it will be no surprise to see more and more yachts entering the River Thames, especially during the summer periods as the city has so much to offer.